Some years ago, as I decided to transition from being a Diamanda Galàs’ devoted fan into a scholar studying her art, I struggled trying to understand her cultural roots. How is one to approach the grief, despair, love, longing for justice, courage, and violence that coexisted in such an unusual way in her haunted songs? It is women who seem to be able to turn weeping into controlled, often contemplative lament: “tears become ideas”, I read in a book titled Dangerous Voices: Women’s Laments and Greek Literature (1992) by Gail Holst-Warhaft, undoubtedly one of the most distinguished experts in Greek lamentation and in the relationship between grieving, art, and politics. Love, death, departures, and the fall of great cities, are all recurring themes in the lament genre, and The Fall of Athens, Holst-Warhaft’s new book, incorporates them all into one “song about remembering”. Through a narrative which is both complex, and yet extremely endearing and accessible, she harmonically integrates heterogeneous texts and literary genres: history, chronicle, classical theatre, autobiography, personal correspondence, poems translated or written by her (of which one is dedicated to Galàs). She leads us through a peculiar oscillation between past and present, personal and political life, stories and history. 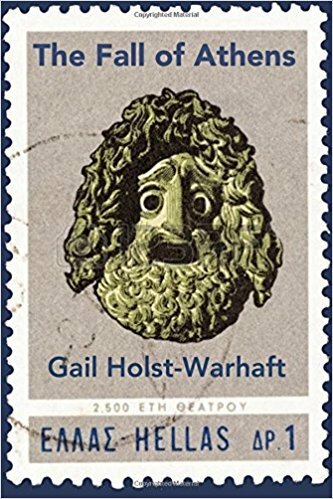 She thus provides us with a glimpse of Greece that completes and challenges the classical idea of Greekness, which is too often oblivious of women’s cultural contribution, of popular culture brought through migratory flows, and generally of anyone who was born after Aristotle. The Fall of Athens is also a passionate mosaic of emotional reminiscences, fragments of an intimate dialogue – as she writes, this book is about a country and a city I came to love. I sometimes think of Greece as an aging lover, his beard turned grey, a glint still in his eye.Through her work as a translator and her collaborations as a harpsichordist the author has achieved not only knowledge, but intimacy and political solidarity with Greek musicians, poets, playwrights and directors such as Mikis Theodorakis, Thanassis Athanassiou, Mariza Koch, Karolos Koun, Iakovos Kambanellis, Katerina Anghelaki-Rooke. A common thread binds them all, and it is the brave and uncompromising devotion to art, in a culture where, far from being just entertainment, art is dangerous – it can trigger revolutions among its audience, and bring death and torture upon artists. Dangerously empowering is the vibrant material of this book, which couldn’t be more timely for the political and cultural moment in which it has been published. to utter the great Yes or the great No. And with conviction and honor, on he’ll go. he would say no again if he were tried. Yet his life is weighed down by that proper no. Holst-Warhaft, Gail. Road to rembetika: music of a Greek sub-culture: songs of love, sorrow, and hashish. Athens: D. Harvey, 1975. Holst-Warhaft, Gail. Dangerous voices: womens laments and Greek literature. London: Routledge, 1995. Holst-Warhaft, Gail. The cue for passion: grief and its political uses. Cambridge, MA: Harvard University Press, 2000. Holst-Warhaft, Gail. The fall of Athens. Burlington, VT: Fomite, 2016.